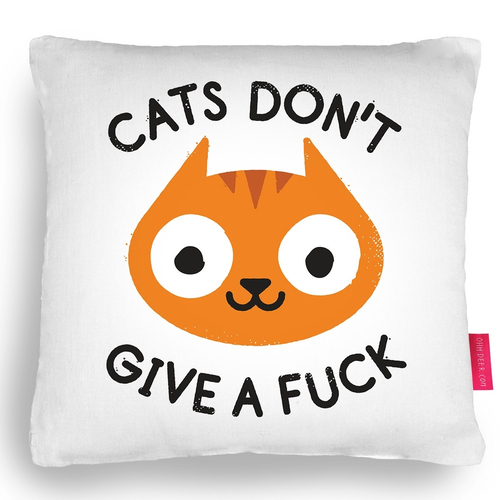 ​Make a bold interior statement with this lovely feisty cushion. The punchy slogan cushion features a warming, cute illustration by cult creative David Olenick. This cushion is perfect for all you cat lovers out there and will give a quirky design feature to any sofa or chair. This cushion is perfect for all you cat lovers out there and will give a quirky design feature to any sofa or chair. Dimensions: 43x43cm (contains 50x50cm insert to keep it plump). Machine washable at 30°c and hand made In UK. The cushion has a stone coloured back cover - and zip fastening.